Beautifully landscaped and nestled on the gorgeous Clam Bay of Marco Island, Florida, is the South Seas North condominium complex. Built in 1979, and located at 591 Seaview Court, in the private, gated community of South Seas, it has both mid-rise and low-rise buildings. The impressively maintained units make this property a perfect second home and a fantastic investment. Typical of Marco Island condos, they range from 964 to 1,173 square feet and are as cozy as they are elegant. All floor plans have two bedrooms and two bathrooms. Laundry facilities are in the condo - no hauling laundry around. Each condo has a view of either Clam Bay or the lush landscaping of the community. 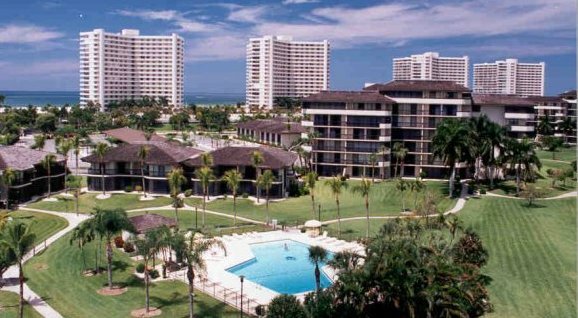 The amenities of the entire South Seas Club community are accessible to any resident of the South Seas North or any other condominium within the neighborhood. For the health conscious, a fitness center with access to state-of-the-art equipment is available. There are tennis courts, heated, private swimming pool, and boat docks for the outdoorsy owners to enjoy. Sprinkled throughout the property are many ponds and plant life, which are landscaped to perfection. The large outdoor pool is a favorite past time for the sun lovers. As well as the main reason to come to the area, the beach. With the most spectacular views of the Gulf of Mexico, this island paradise is a favorite for many. With four different restaurants to choose from within a stone's throw, there is never a problem finding goodies for everyone’s appetite. From fresh catch, and wonderful cuts of meat, to ice cream and pizza, the cuisine here cannot be beat. Where is South Seas North? End Unit With Wrap Around Balcony And Great Views. South Seas Is A Desirable Guard Gated Community With Abundant Amenities Including A Pool, Tennis Courts, And Beach Access! Close To Restaurants And Shops. Tile Throughout. The maintenance fee for South Seas North condos is $565 and it's put to good use. Not only are things like cable TV and "hurricane insurance" included in it, but the general upkeep of the buildings and grounds is top-notch. To evaluate all Marco Island condo fees and other stats, visit any of our Condo Comparison© Charts like the one above. Pets aren't allowed in South Seas North. We have listed all the pet-friendly condos in our Waterfront Condo Comparison© above. The minimum rental period in South Seas North is 30 days. Condos with 30 day minimums rentals rent very well in season. Often, Snowbirds will stay for three months or more. There are total of five different floor plans in South Seas North. They are all two-bedroom plans and have washer and dryers in each unit. Click here to see all South Seas North floor plans.